While supervillains have become a staple in today’s comic books, it wasn’t until the Silver Age (mid 1950’s-late 1960’s) that readers saw a boom in their creation. Golden Age comic book stories (late 1930’s-mid 1950’s) were mostly characterized by conflicts between the superhero and everyday bad guys such as bank robbers, mobsters, common thugs, crooked politicians, and – perhaps most notable for that era – the Nazis. With a newly revamped Flash that debuted in Showcase #4 (Aug. 1956), Carmine Infantino and his crew proceeded to introduce an array of supervillains to pit against the Crimson Comet. Showcase #8 (Apr. 1957), Barry Allen’s second appearance, gave birth to one of the Flash’s most prominent rogues: Captain Cold. But the hero in red wouldn’t be the Captain’s only rival. Making his first appearance in Flash #140 (Sep. 1963) is Mick Rory, a.k.a. Heat Wave. 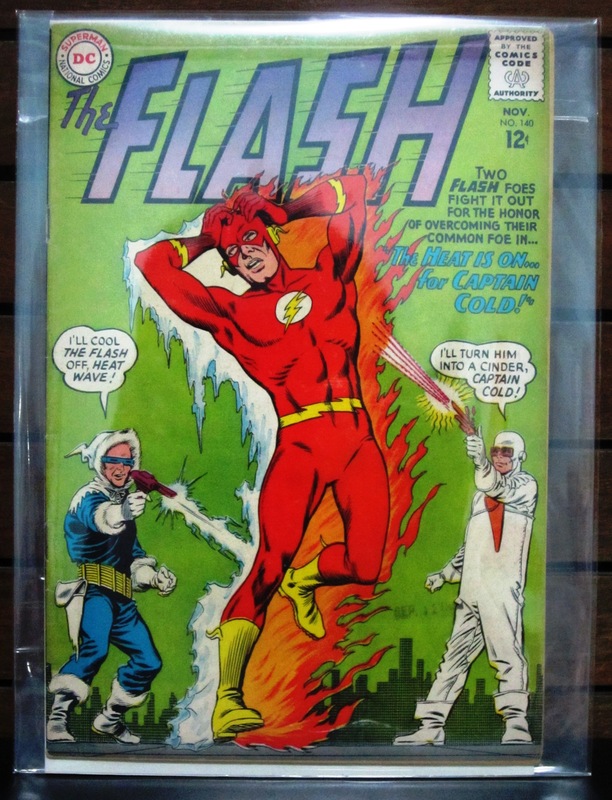 In the story, the two criminals initially hit it off as Heat Wave helped Captain Cold escape with his loot by attacking the Flash just as the icy criminal was about to get caught. However, things quickly turned sour between the two. They found themselves at odds with each other after a short conversation revealed they were after the same girl – a TV celebrity widely known by her stage name, Dream Girl. This was the beginning of a rivalry that has so far lasted for half a century. Although the two supervillains belong to the same super group (fondly called the Rogues), readers still find them constantly butting heads over issues such as who should be the leader of the gang or whose fault it was that the job didn’t go as planned and so much more. This volatile relationship caused by their constant bickering has created a unique dynamic among the villains of the Flash mythos, and has kept its readers entertained through several decades. From my collection: The Flash #140 (Sep. 1963), Heat Wave’s first appearance – one of my favorite Silver Age stories and cover art. In the eighth issue of Marv Wolfman and George Pérez’s ground-breaking series Crisis on Infinite Earths (1985-1986), the Flash sacrifices his life to destroy the Anti-Monitor’s ultimate weapon: an anti-matter cannon threatening to wipe out all reality. This monumental event, easily among the top 50 events in comic book history, has defined what the Flash legacy stands for: hope in adversity, and an unflinching spirit determined to do what is right. From my collection: A near-mint copy (CGC 9.8) of Crisis on Infinite Earths #8 (Sep. 1985). Up until the early 60’s, most comic books cost only 10 cents. If you were a kid living in the 1940’s and you had 10 cents to spend, you would have had to choose between ice cream, candy and comic books. The movies would have been too expensive for you, since they cost a little over 20 cents. Apart from toys (which you probably had to convince your parents to buy for you), your only other forms of entertainment were the radio and television. And, by the way, the TV didn’t have color until around mid-50’s; and they were too expensive for most families then. It’s no surprise how comic books kept a lot of kids (and even adults) entertained with their colorful pages, fantastic stories, and super-powered protagonists – just as they continue to do so today. All for just 10 cents. My first ten-cent tales (L-R): Flash #115 (Jul. 1960) where Flash becomes morbidly obese, Flash #116 (Sep. 1960) where Flash battles a man from another dimension, and Flash #119 (Jan. 1961), an early appearance of the Mirror Master, and Ralph Dibny marries Sue Dearbon (on her first appearance in comics, no less).